Like previous versions of windows, Windows XP uses a desktop for the standard interface. Think of the desktop as work spaces where you can access everything you need to operate your computer, such as system components applications. the Internet, etc. 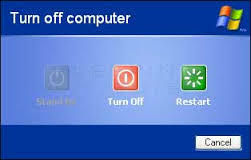 Start button: One of the most important tools you will use while working with windows XP. The Start button allows you to open menus and start applications. 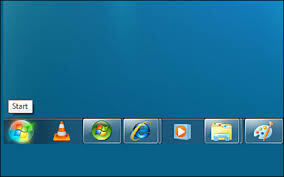 Task bar: Primarily used to switch between open windows and applications. Learn more about using the Task bar in a later lesson. Icons (or graphical pictures) : Represent applications, files, and other parts of operating system. By default Windows XP provides you with one desktop icon, the Recycle Bin. Your desktops appearance may vary from the example shown below, especially, if you bought a computer with XP pre-installed. To begin exploring Windows XP, click the Start button. When you click the start button, the Start menu appears. The Start menu is your gateway to applications that are on your computer. The left side of the Start menu lists programs, and the right side allows access to common Windows folders (My Documents, for example). It also provides access to Help and Support, Search, and Run. If you select All Programs, a pop-up menu appears. Pop-up menus like this are called cascading menus. 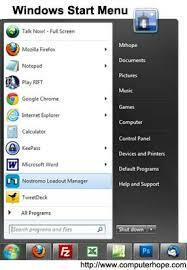 If a cascading menu is available, a small black triangle appears next to the name of the application or function. Move the mouse pointer to each option, and view the various cascading menus. Click (or roll your mouse pointer over) All Programs. Move the mouse pointer to the right and view other cascading menus. To exit the menus, click outside the menu area or press Esc on your keyboard. The small pictures on the desktop are called icons. One type of icon is an object icon. Examples of object icons are my Computer, recycle bin, and internet explorer. These icons allow you to open files and programs on your computer. Shortcut icons allow you to open an application quickly. 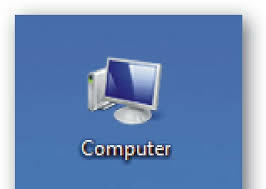 These icons appear on your desktop and with little arrow in the left corner. Desktop shortcuts are links to files and programs. you can add or delete shortcuts without affecting the programs on your computer. Place your mouse over the icon. Text appears identifying its name or contents. The task bar is the small blue bar you see at the bottom of your desktop. It contains the Start menu and Quick Launch bar, which contains icons for Internet Explorer, Windows Media Player, and Show Desktop. Click an icon to open a program. Click Show Desktop to quickly view your desktop without closing any programs or windows. The box on the right is called the Notification Area. Here, you'll find the clock and several other icons depending on what you have installed on your computer. Other icons appear in the Notification Area detailing the status of your activity. For example, when you're printing a document, a printer icon appears. Microsoft also uses the notification Area to remind you when the software updates are available for download. When you open or minimize a window or program, a rectangular button appears on the task bar that shows the name of the application. These buttons disappear when you close a window. More than one person may use your computer. Windows XP allows everyone who uses your computer to have a separate computer accounts. A computer accounts tracks each person's unique settings, documents, and email accounts. Windows Xp even enables you to log off the computer so someone else can log on without having to restart the computer. Click the Start menu and click Log Off. Switch User allows someone else to log on to the computer. If you choose to Switch User, your applications will continue to run in the background while the new user logs on. If you choose Log off, your applications will close. In any case, you're taken to a Windows XP log on screen where you're prompted to enter your username and password. When you've finished using Windows XP, be sure to turnoff (or shut down) the computer correctly. Programs enable you to do do word on the computer. For example, a word processing programs such as Microsoft Word pad allows you to create a basic document. 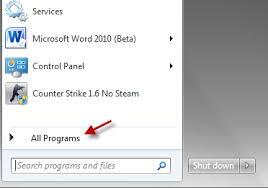 You can easily open a program from the Start menu using the All Programs button. Click All Programs and slide your mouse pointer until you've selected the program you want to open. Click to open the program you've selected. To close a program, click the close button located at the top right of the window. Sizing window is slightly different from minimizing, restoring, or maximizing. Place a mouse pointer over any corner of the window. The mouse pointer changes into double-headed arrow. Click and hold down the left mouse button. Drag the arrow out or in to make the window larger or smaller. Release the mouse button when the window is the size you want. Make sure the mouse pointer change into a two-headed arrow before you try to size the window. Like previous versions of windows, Windows XP uses a desktop for the standard interface. The Start menu is your gateway to applications that are on your computer. The taskbar is the small blue bar you see at the bottom of your desktop. It contains the Startmenu and Quick Launch bar, which contains icons for Internet Explorer, Windows Media Player, and Show Desktop. A computer accounts tracks each person’s unique settings, documents, and email accounts. 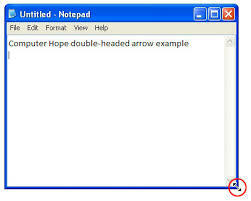 Write short note on windows explorer. Windows exploreallows exploring the content of computer. It divides the window into tow vertical sections. The left section display list of drives and folders and the right section display folder and files. What is window operating system? Microsoft Window Operating systems are popular operating system for personal computers. They are Graphical User Interface. It makes hardware usable in computer and provides environment to work on software. MS Window 98, Windows XP, Windows 7 etc. are some examples of windows operating system. What is the basic layout of start menu? The left side of the Start menu lists programs, and the right side allows access to common Windows folders (My Documents, for example). It also provides access to Help and Support, Search, and Run. How can icons be used to open a program? The two ways to arrange multiple windows on the desktop are ______. To reverse your last action or command, you would use ______ feature. CD Rom is used for storing __________. To close a misbehaving program, we have to press ______. Alt+Tab key is used for _________. Switching between two closed program. Switching between two open program. Any Questions on 'Windows XP '?